The exterior of your house is what people see first so the saying, first impressions count cannot be avoided. As a homeowner, we are always looking for ways to refresh our homes to make them look more attractive or increase the resale value when selling time comes – and we want to do it all in the most cost effective way. Most turn to refresh the inside of their homes first and it’s not uncommon for the importance of a great looking exterior to be overlooked. Here a few ideas easy enough to make a start on this weekend, to have the house everyone on the street is looking at as they pass by. Homes with a welcoming entrance feel inviting and have the power to entice potential buyers and warmly greet family and friends, so laying down pavers to lead to an eye-catching front door can play a huge part. Wood is the most popular material choice for front doors and can be stained or painted to match the rest of your exterior, whilst stainless steel doors can look stunning and can be jazzed up with glass inserts. If you don’t have the budget to replace your entire door, consider a fresh coat of paint and a new door knocker. Bright door colours can look fantastic against the neutral colours of your home’s exterior. If you need another excuse other than looks to buy a new door, a good door will also be able to seal well in its frame to keep air from leaking out – making your home more energy efficient. Fencing and gates are often the first thing that someone sees when they arrive at your home so making sure they are appealing can go a long way or simply be a nice way to say ‘welcome home’. For those that haven’t installed fencing, they can act as a great investment and provide adequate security or privacy, effectively moving the first line of defence away from your front door. Existing fencing and gates can be spruced up by repainting or resanding and applying a fresh coat of polish / stain over, depending on the materials used. Check your gates and make sure they are all in working order, not squeaking or stiff to move. Simple repairs to wood fences can be done with waterproof glue and both fences and gates can be washed down to make them look cleaner and newer. If your garage door is really old and wearing down quickly, replacing it entirely can boost the look of your home and give you the options of durable and rich looking designs. Unfortunately, an entire new garage door isn’t in everyone’s budget so consider simple things as well like a repaint, replacing of a few panels or a good scrub. Smooth and quiet operation is also a must. No one likes a noisy, rattling or whiney garage door, and if looking to sell it can make a big difference on how potential buyers view the quality of your garage. An oil of the rollers or other components can make a huge difference. As with front doors and windows, garage doors can determine the energy efficiency of your home so checking for leaks and weatherproofing your garage door can help your heating and cooling systems work more effectively inside. A fresh paint job does wonders for your home’s exterior on both the walls and gutters. Find colour schemes that suit the style and era of your home and also blends with the surrounding houses. Neutral colours are best to fit with most people’s tastes, especially if you are planning to sell soon. If you want bolder colours, consider sticking with neutral colours for the main section and painting the trims, shutters and front door with contrasting colours that stand out. Installing outdoor lighting such as lamps or solar-powered garden lights along your pathway or by the front door can add some after dark charm to your home. Not only will the lighting compliment the exterior, but it will also provide safety and security. 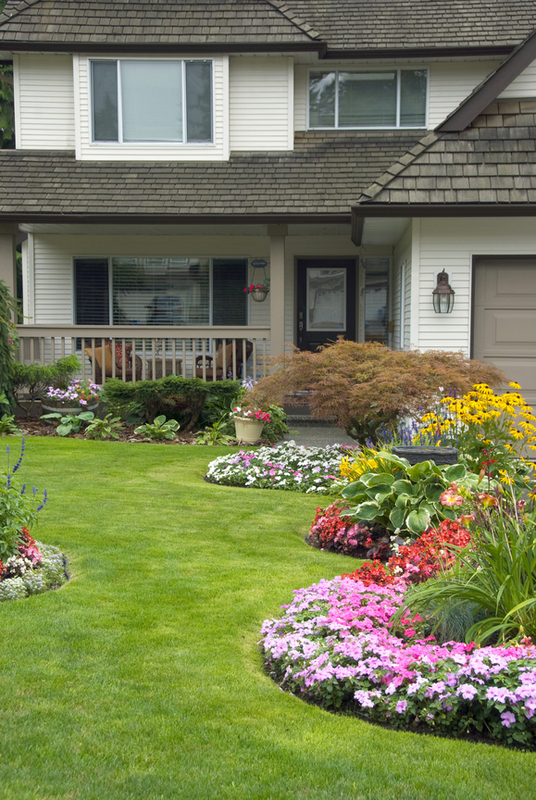 Renewing and landscaping the outdoor gardens can be as simple or as complex as your budget allows. In a day, pruning and weeding the garden beds and adding some new soil can make your gardens look brand new. If you have flower beds in your garden or lawn area, consider outlining the flower beds to enhance its appearance, this is an inexpensive and easy setup to accomplish. If a trip to the nursery is in order, look out for low maintenance plants or fragrance flowers such as lavender that make the entrance to your home smell beautiful. This article is written by Jayde Ferguson, who writes for Fencemakers, Perth, Western Australia’s complete range of fences, gates and pool fencing.